Students will be able to use action verbs when writing. Ask students what a verb is. Tell students that verbs are words that describe actions or states of being. Have students popcorn share different verbs. Write some of the verbs that students share on the board. Explain that verbs can describe actions or states of being. The verb run describes an action that someone takes, while the verb believe describes a state of being. Circle all the action words that you've written on the board. 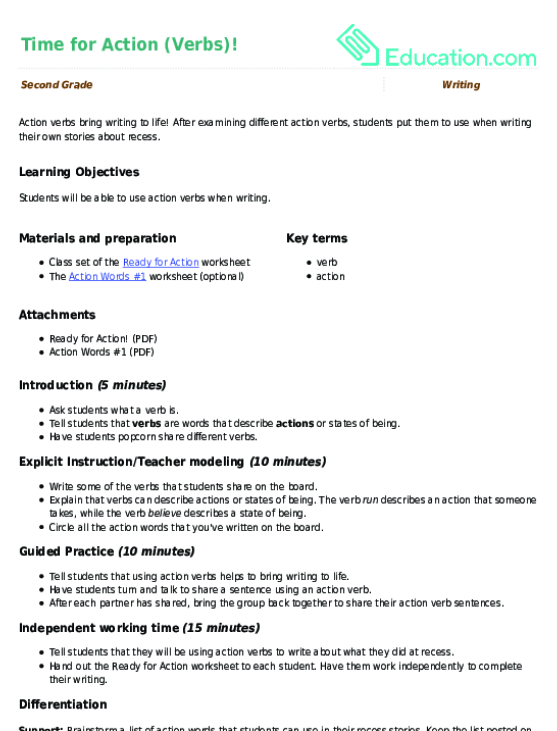 Tell students that using action verbs helps to bring writing to life. Have students turn and talk to share a sentence using an action verb. After each partner has shared, bring the group back together to share their action verb sentences. Tell students that they will be using action verbs to write about what they did at recess. 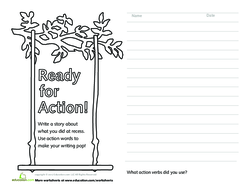 Hand out the Ready for Action worksheet to each student. Have them work independently to complete their writing. 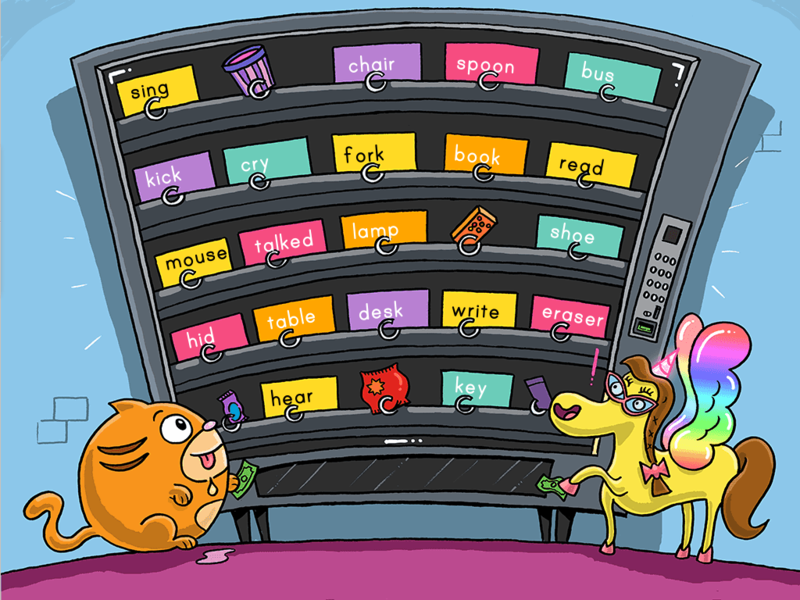 Support: Brainstorm a list of action words that students can use in their recess stories. Keep the list posted on the board or on a piece of paper next to the students who need it. 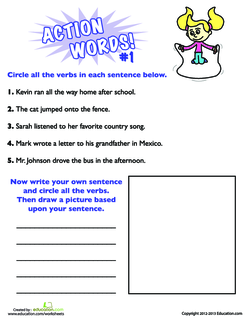 Enrichment: If students finish early, they can complete the Action Words #1 worksheet. 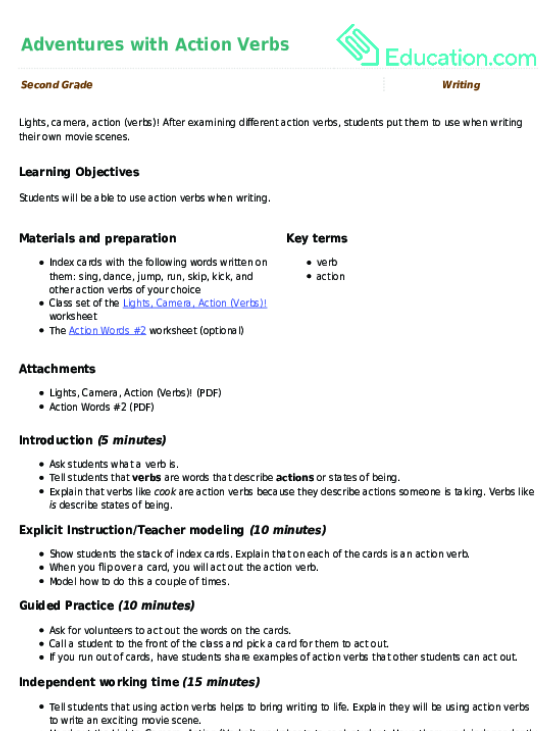 Assess how students are using action words in their writing. Ask for volunteers to share their writing. After each person shares, ask students to identify action verbs that they heard. It’s time to write a movie! Have your students put on their director hats as they write an engaging movie scene using lots of action verbs.